Whether you are a virgin-joint-roller or are a veteran looking to brush up on your skills here are 3 ways to roll the perfect joint every time. Whether you are a virgin joint-roller or a veteran looking to brush up on your skills, it never hurts to work on your joint rolling technique. So grab your grinder and some papers, it’s time to get down to joint rolling business. Hand-rolling is generally what people start out with, but it’s arguably the hardest method of rolling. There are plenty of tips and tricks to it—using a filter properly, rolling in a cone shape instead of a cylindrical one, making the perfectly twisted tip to avoid canoeing—but when it comes down to rolling you really just want to get the basics down before branching out into making ridiculous joints. The trick is finding the right size paper—single wide, the smallest size can be a little tough to get the hang of, but so too can the large king size papers. It’s best to start out with papers that are around 1 ¼, giving you enough space to maneuver but not so much paper that it gets in the way. Fold your rolling paper in half and grind up a bunch of stem-free weed to put in the center. Roll the ends of the paper against one another to pack the weed, then slip in the properly sized filter of your choice (an accordion fold or simple roll are the easiest, but there are plenty of crutch choices available). For a straight roll be sure to keep the edges of the paper even as you roll the front edge into the back of the sheet and down behind your weed. Lick the glue strip and close the paper up. For a conical roll, start rolling the paper at the filter side of the joint, making sure that the open end’s paper is held slightly higher as it’s rolled into the back side of the sheet. Lick it closed; you might need to put some more weed into the end and then shake it to pack like you would with the pre-rolled cone. With these three techniques under your belt, you’ll be the center of attention at the next smoke sesh. With the proliferation of ready-made cones, pre-rolls have become the most convenient method of making a joint by far. All you need to do is grind up some bud (stem free!) and stuff it in the paper. You can mix in kief or a bit of hash—just make sure that it’s incorporated into the flower and not in its own layer or the joint will have trouble staying lit evenly. Be sure to pack the bud down into the cone when you roll. You can do this in two ways: either push it into the paper with something like the back of a pen or an orange stick or just hold the open end of the joint and flick the joint loosely against your palm a couple of times to get the weed to settle down. The latter method tends to be better, not just because it eliminates the likelihood of accidentally poking through the paper, but also because it’s harder to over-pack a joint this way (which can also make it hard to keep the joint lit). Machines are the unsung heroes of making even, fat joints. You can grab a rolling machine at any head shop for around $2; it’s a little plastic rig with a roller stretched over it. Using it is easy once you get the hang of things, though you might end up with a mess the first few attempts (make sure you’re doing this on a big, clear surface like a table—it’s easy to end up covered with weed the first few times you try it out). Orient the machine so that the roller you pull down is facing you. Put ground up flower onto the sheet between the two rollers and close it up so that they’re touching one another. (Like with any rolling method, make sure to take the stems out of your bud!) Spin the rollers up and against one another so that the weed condenses into a tube-like shape, and then stick the paper in glue-side up and facing you. (It’s important to get the direction right so that your kush doesn’t get stuck outside of the paper.) Push the front roller up, holding them both together, and when the glue is ready to sink into the machine give the strip a lick before rolling it all up quickly, so the glue doesn’t stick to the plastic belt. For those who aren’t familiar with the concept of a spliff, it’s a joint that contains both weed and tobacco. While many stoner purists (as far as North America goes) may be opposed to the idea of mixing the two, it’s actually quite a common practice in parts of Europe and the UK. Not only is it better for achieving a more subdued high, many people also mix in tobacco for the taste. 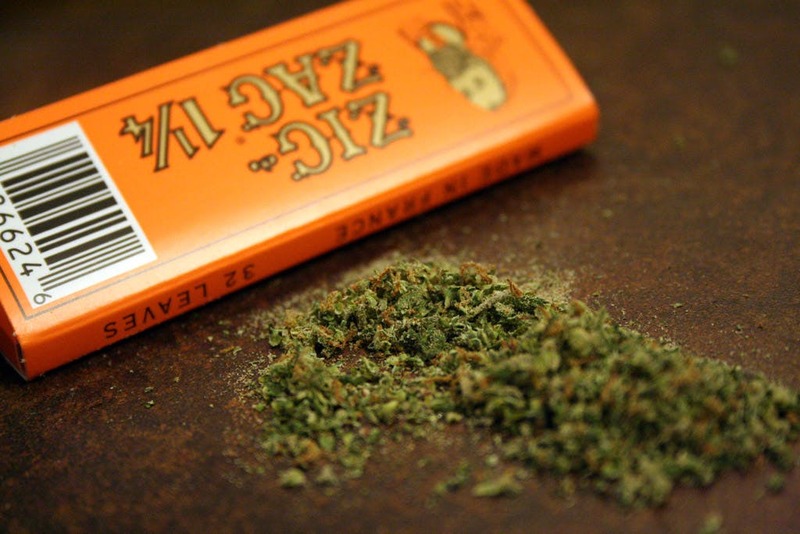 If you’re looking to try out a spliff, here’s a step-by-step guide to rolling one. Step One: Before we get into rolling the spliff, make sure you have the following materials on hand: skins (Rizla Red Kings for beginner, or Silver Kings for the rolling veteran), tobacco, weed, and a thin piece of cardboard (to make the roach). Step Two: Take a skin, gum side (the sticky bit) facing you, and put it on a hard surface that you can easily reach with your hands. A dish or tray is a good starting point. Step Three: Roll your cardboard into a roach and if you’re right handed, put it on the left end of your spliff (right end if you’re left handed). Step Four: Spread a thin layer of tobacco onto the skin, and then distribute your weed over top of the tobacco. A typical starting ratio is 60:40 tobacco to weed, but you can change up the quantities of each based on your individual preferences. Step Five: Pick up the skin and start rolling the spiff into a cylindrical shape, while mixing the weed into the tobacco evenly. The idea is to get the skin to catch under itself, wrapping around the contents snuggly. While this is a bit of trial and error, you’ll get better at it with more practice. Step Six: Once you have your spliff rolled up tightly, lick the gum, and seal your roll. Final Step: Twist the end of the spliff (without the roach) to finish, and you’re ready to light up! Kief, the best part of your herb, all in one place. I’m sure you have ogled over joints coated in kief, but do you know what is even more amazing? A joint made completely out of the stuff. Instead of keeping your kief to make hash, you can roll an epic joint with it. Watch and learn how to make your own amazing kief joint in this video from Explicit. Step 1: Before you even get started, you will need to amass a decent load of kief. If you don’t have access to loads of bud, then this might be an arduous process of letting it accumulate in your grinder. Step 2: Once you have about a gram of good kief, the fun can begin. You will need parchment paper, a flat iron, a dull knife, and some finely ground herb to top off your creation. Turn on your flat iron to the lowest setting. Get your parchment paper and fold it in half, then open it. Put your kief in a pile and use the knife to spread it into a solid, uniform layer. Step 3: Like the Rosin extraction technique, you press the flat iron on the kief, heating it. The goal is to make it stick together into a “tortilla” of kief. You will be able to tell which parts have heated by the color change through the parchment paper. Step 4: Once your kief is melted into a solid layer, you will peel the paper away, and gently roll it into a joint. Don’t add anything inside yet. Even small stem pieces can puncture the kief layer at this soft stage. Step 5: Pinch one end closed and begin to gently load your finely ground herb into the other end. You don’t want to pack tightly, it might compromise airflow. Be careful on handling the joint as it will still be somewhat fragile. Open the closed end with a little pressure, and there you have it! When smoking, don’t ash or press, as you will lose the cherry, and waste kief. Do you want a joint with an extra kick? If so, then you should roll yourself a nice oil joint. Not only does it taste surprisingly amazing, but it also will get you super high. Not to mention, an oil joint will burn evenly and slow, so you’ll get the most out of every hit. All you need is your favorite strain, some high-quality oil, joint papers, and a dabbing tool. That’s it! Be sure to check out the video below to learn how to roll an oil joint. Note: You might want to jump to 4:30 of the video when he starts making the joint. In this video by WEEDSAUCE, he is adding cannabis oil, which contains a whopping 91.7% THC. Rolling an oil joint is just as easy as rolling a regular joint. However, by adding cannabis oil to your bud, you’re giving your joint a little something extra. To start with, you’ll need to assemble the goods, which include your cannabis, joint papers, hash oil, and a dabbing tool. Once you have those, it’s time to roll. First, use your dabbing tool to collect your hash oil and spread it evenly across the joint paper. But be sure to leave enough space for your finger, or else you’ll soon have a sticky mess on your hands. Then, grab your desired amount of cannabis to sprinkle on top of the hash oil. Before proceeding to roll, make sure that everything is nice and even. Finally, it’s time to tuck and roll. But do so carefully, because the oil makes rolling a bit tricky. If necessary, use a tool to push the weed on both ends so that it’s more compact. After you’re done, twist both ends, cut them, and light up! When it comes to joint rolling, “practice makes perfect” can be a fun process. Grab some paper and improve your rolling technique—and then smoke all those beautiful joints you have crafted. But aside from simply sitting down and practicing, from the papers you choose to how you grind your cannabis, there are a few things you can do to ensure the optimal joint rolling process. The paper you choose might be the most important decision you make, ever. There are many different papers available on the market, made from different materials. Higher quality or eco papers will have fewer contaminants. You can also buy papers with flavor added if you like some extra taste, but those may have artificial dyes, bleaches or other toxins (if you’re worried about health risks or the environment). Choose a rolling paper that doesn’t add a bad taste to the joint, as some papers leave an aftertaste that not everyone likes. Papers that are thin and burn evenly and slowly are best. Some people prefer hemp rolling papers because they don’t burn between puffs. Read our full guide on the best rolling papers here. Bonus tip: If you like carrying papers with you, buy a rolling paper protector. It sounds lame, but it stops the papers from bending and tearing, making them easier to use. Although it’s not necessary to have a grinder, it’s helpful to have one. They save time in the rolling process and provide a place to store your weed if you’re transporting it. It also makes it easier to evenly grind the herb. Fine-grinding ensures that you won’t use as much marijuana, saving you money. Plus, you can get one of the best grinders to show off your personality. Don’t rush the grinding. Take your time breaking down the weed, so you can be sure it rolls more evenly. Remove all stems and make sure the buds are broken into smaller pieces. This protects your paper from tearing. If you’re still struggling with rolling a joint, or are having trouble keeping your cannabis from falling out of the rolling paper, you could find worse advice than that of Wiz Khalifa. Khalifa—a bonafide cannabis king—released a video a few years back that gives a fresh take on joint rolling, and is especially helpful for beginners. His advice more or less boils down to one simple step in the joint rolling process. Before adding cannabis to his rolling paper, Khalifa takes the bottom corner of the paper, on the opposite side that the filter will go into, and he twists it. Even expert joint rollers know that one of the most frustrating parts of rolling is when cannabis spills out of the end of the joint and onto the floor. It creates an unnecessary mess, and worse, is a colossal waste of cannabis. But by twisting up this bottom corner of the paper, you’re able to create a bowl-like shape at the end of the paper that perfectly contains your cannabis and prevents it from spilling out. After you’ve twisted up the end, simply proceed to roll the joint, then tuck the filter in at the end. A roach (sometimes called a crutch or a tip) is a piece of tightly rolled cardboard placed at the end of the joint when rolling to prevent it from closing. A joint with a closed end is harder and more frustrating to smoke, so a roach keeps the smoking process pleasant. The roach also helps direct the flow of smoke and prevents weed from falling into your mouth (unless you’re into that sort of thing). Even better, it prevents your lips and fingers from getting burned. There you have it! Our complete guide on how to roll the best joint. Whoever said practicing wasn’t fun?